The Spatial Analyst toolbar provides two interactive tools useful for simple exploration of your data. The selected Layer identifies the raster that the tools will be applied to. 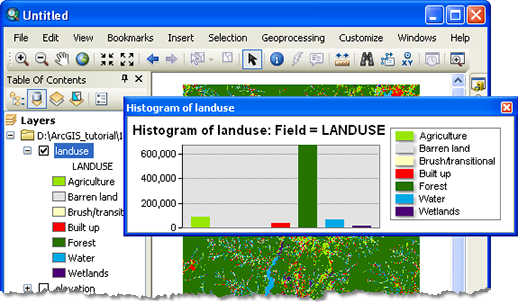 There are two interactive tools you can use on the Spatial Analyst toolbar. When a suitable raster layer is added to the table of contents in ArcMap, these tools will become available. The Create Contour interactive tool enables you to create individual contours (lines that connect cells of equal value) at specific locations on a single-band raster. You might want to identify locations at the same elevation, with the same temperature, or with the same atmospheric pressure. Click the Layer drop-down arrow and choose the raster layer you want to use. Click the Create Contour tool . The cursor will change in appearance to the following: . Wherever you click, a contour line is drawn based on the crosshair location. The contour height is also reported in the application status bar. To finish drawing contours, click the Select Elements button on the Tools toolbar. To delete a contour, select the one to remove with the cursor and press the Delete key on your keyboard. To select multiple contours to delete, hold down the Shift or Ctrl keys and click them. Once the contours are selected, you can also right-click and select Delete. The contours are drawn as graphics, so take care not to inadvertently shift or change the shape of them. The contour height is recorded as the Element Name of the graphic. You can access this value by selecting a particular contour line, right-clicking it, and selecting the Properties option. In the resulting dialog box, click on the Size and Position tab. The Element Name is the height for the selected contour line. This is useful because it enables you to see the height the contour graphic line represents by opening its properties. It also enables you to copy the height value for pasting somewhere else. You'll also see this value in the title bar of the properties dialog box. 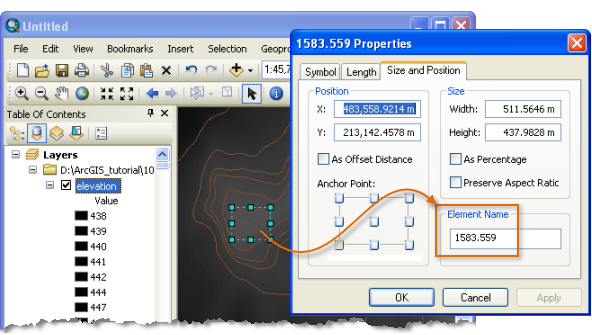 You can also convert the selected contour graphics into a feature class or 3D shapefile. To do this, activate the Draw toolbar and select Drawing > Convert Graphics to Features. The name (height) of each graphic is automatically added to the Name field in the output shapefile or feature class that is created. As a result, the output feature will automatically contain an attribute showing the height of each contour line. This can also be used to label the contour heights. The Histogram interactive tool enables you to explore the distribution of values in a raster layer. For example, you might want to know the number of cells (the count) with a certain value, such as the number of cells that are forested land or vacant property. Set the raster to create a histogram for by clicking it from the Layer drop-down menu. Click the Histogram button . The histogram bar graph appears in a new floating window. The histogram is symbolized using the field specified in the Table Of Contents. To create a histogram based on the values of a different field, first change the Symbology for the raster layer to use that Value Field. If you wish to change the appearance of the histogram, right-click anywhere on it and select Properties. You can also double-click on the graph to open the graph properties dialog. If you have previously selected certain rows of your raster attribute table, the selection will be honored in the histogram. You can also make histograms for specific areas of the data using graphic selections on the raster data. Note that in this case, the extent of the selected graphics will be used in determining the histogram values, even if some of them aren't visible. The Histogram tool only works on raster layers. Note that joined fields are not supported. The interactive contour and histogram tools operate on the data within the extent of your ArcMap window and at the screen resolution. This provides the benefit of being able to respond quickly even on very large input raster datasets, such as those from mosaic datasets or image services. You can display the spatial resolution in the Table of Contents for the raster data that is being shown in the window. 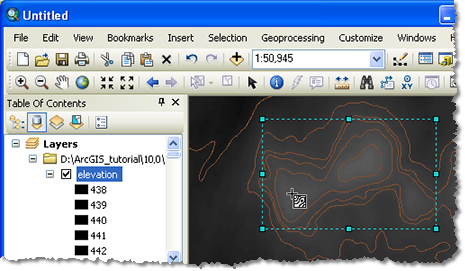 If you wish to create contours on the full resolution of the data, use the Contour or Contour List tools. If you wish to have histograms based on the full resolution of your data, you can try creating them as a vertical bar graph. Contours and histograms can only be created for single-band rasters. Both integer and float rasters are supported.